Insect Ark has been one of my favorite bands in Brooklyn since I moved here in late 2015. They are mesmerizing to see live, be it in the two person formation, or just Dana Schecter (Also of Gnaw) performing as a soloist. It's the sort of beautiful and transcendent post music that you can really get lost in. Now they are back after three years and bigger than ever, released on Profound Lore and a significant step forward for the group. It feels like Marrow Hymns is the sort of authoritative artistic triumph we need to hear in 2018. 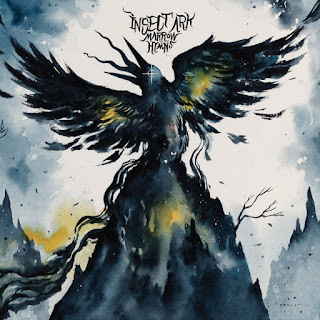 The most notable aspect of Insect Ark has always been the slide guitar, but Schecters mastery of the instrument has really been pushed further on this release, and the haunting melodies crafted fit in perfectly with the eerie soundscapes. The occasional reassuring bottom end swells brings us all back to reality, adding a strange sense of substance to the potent drums, dialed back as per usual to allow a stunning sense of openness. Tied into this is the subdued poetry of the songwriting, each track here is a piece of a journey, tied together by an album that gets all the more fascinating with every additional spin. It's hard not to fall in love with Marrow Hymns. It's a record that embraces all the glory that post music and avant garde is supposed to have, but simultaneously remains surprisingly easy to listen too. The minimalist underpinnings of Insect Ark shine through here and mean that this isn't a record that forces you to pick it apart. Instead it can be listened too on multiple levels, first exploring the mystery and magic around the release, and then on a deeper level, engaging in the songwriting and falling in love all over again.